It's Michigan. It's Ohio State. It's The Game. This is our preview. 14 years. 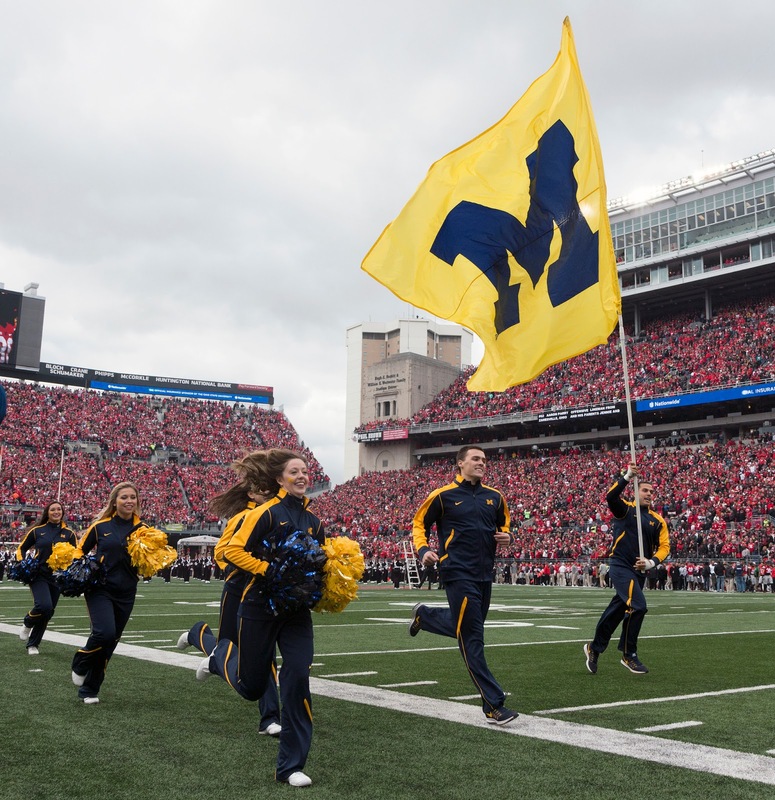 It's been 14 years since Michigan was favored in Columbus. It's been 18 years since Michigan actually won in Columbus. The players currently being recruited by both coaching staffs were not alive yet. The i-Pod had not been released yet. The average price of gas was $1.51. The chances have been there. Good lord have the opportunities existed. 2006 - a late hit by Shawn Crable gave OSU the game-sealing TD. 2012 - Michigan led at halftime but scored zero points in the 2nd half. 2016 - Michigan literally was an inch from winning in overtime, one AP voter even challenged the call and declared Michigan the winner. This year feels different, though. Harbaugh finally has his healthy quarterback. 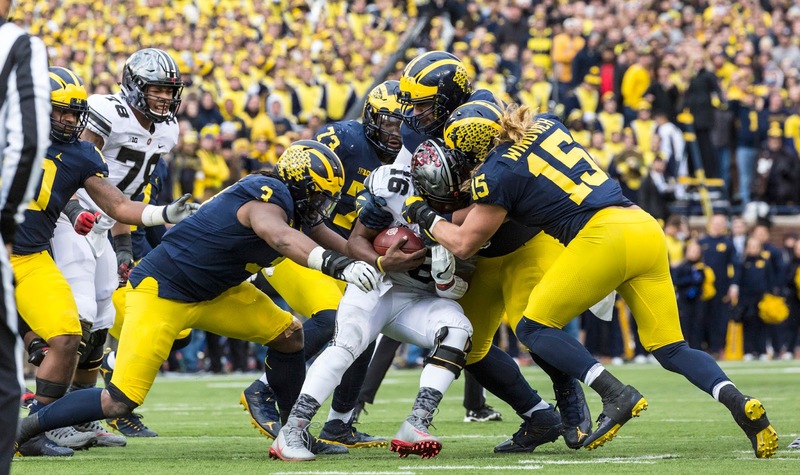 Don Brown's defense is fully operational in a historic way. As for Ohio State? There's a strange vulnerability that's difficult to explain. Like Voldemort down to his last couple horcruxes - still your greatest threat, and yet, vulnerable. Don't fool yourself, this is still a very good 10-1 Ohio State football team. Dwayne Haskins is one of the best quarterbacks in the country. There are 5-star athletes up and down the roster. But for the first time in 14 years Michigan is favored in Columbus because, by all accounts, by all data points, by everything on paper, Michigan looks like the better team. After three years of Rodriguez, four years of Hoke, and three years under Harbaugh that resulted in a disappointing 8-5 season, it's hard to envision when we'd actually be saying this again. After the loss to Notre Dame, how many of you shrugged and said "this again." Yes, Michigan was the better team in 2011, but mostly because Ohio State was crippled by their coaching 1-year coaching inadequacies. Michigan was only the better team by default. 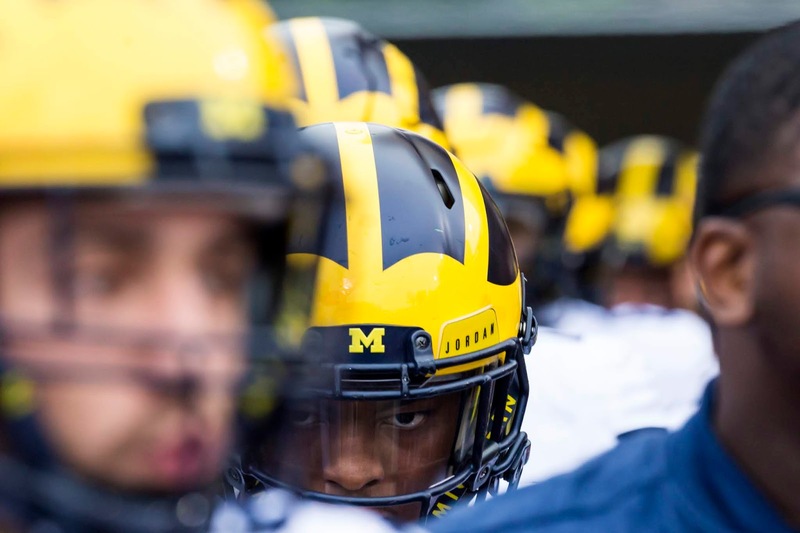 But this year, Michigan simply looks like the better team by being a very good team. This is not something we've said before the Ohio State game in a very long time. This team is pissed off. This team is petty as hell. This team has embraced the idea of the Revenge Tour. Jim Harbaugh as Arya Stark has one name left on the list. Last year in The Game, Ohio State's offense did not get to full speed until JT Barrett went out with an injury. Dwanye Haskins (#7) came in and was an immediate improvement, especially in the passing game, finishing the day 6/7 for 94 yards. The first one is into double coverage. The second one hits his guy in stride in the endzone. Haskins will be the final boss of the schedule. A win tomorrow means a re-match against a now healthy Clayton Thorson. But most of Haskins' yards are in the short yardage game. In fact the staple of this Ohio State offense is to get the ball quickly to the play-makers in space and let them feast. 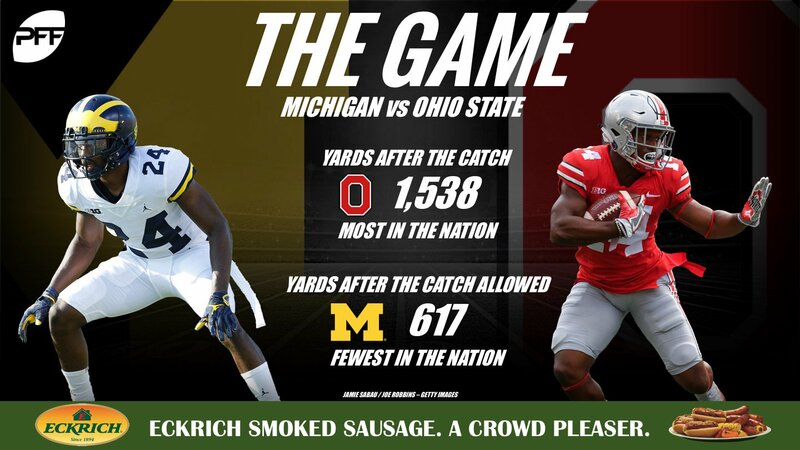 Per Pro-Football-Focus, Ohio State's 1,538 yards after the catch are the most in the country. Michigan's 617 yards after the catch given up are the fewest in the country. There was one deep pass that I saw where Parris simply beat his man and Haskins dropped a dime. Otherwise it's dump it to the flat and follow your blockers or run a slant. Since the Northwestern game slants have not been as big of an issue for Michigan, but Campbell is faster than anyone on Northwestern's receiver group. At running back, Ohio State has been sharing duties between J.K. Dobbins (#2) and Mike Weber (#25). The Buckeyes have struggled running the ball this year and part of this may be a result of QB JT Barrett's absence. Last year JT rushed for 798 yards. 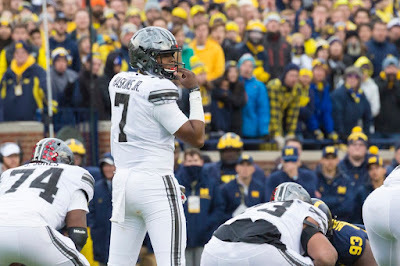 This year, Dwayne Haskins has 93 total rushing yards, 59 of which came against Maryland. Against Purdue the Buckeyes rushed for 76 yards, 92 against Minnesota, 119 against Penn State, and 120 against Michigan State. The loss of having a realistic dual-threat QB is being felt. Still, Dobbins has 915 yards (4.7 avg) and Weber has 711 (5.6 avg) which are by no means bad numbers, just not elite numbers. 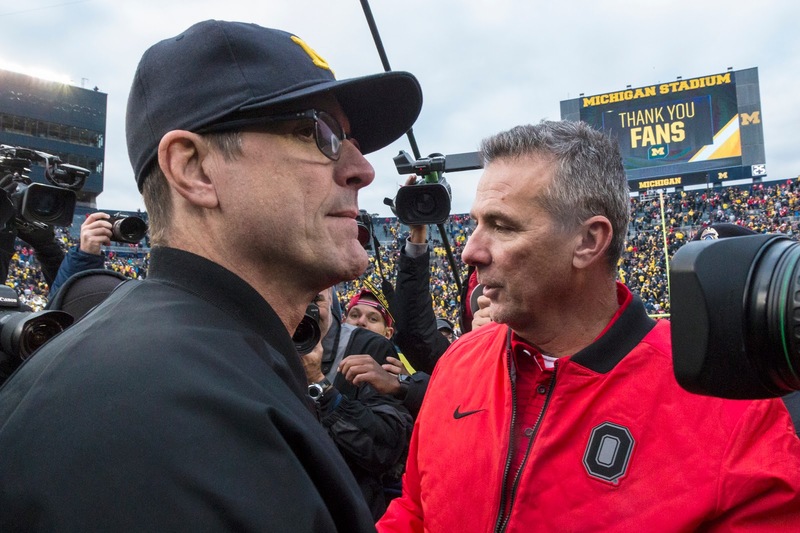 As a 3rd party sports fan, Michigan's elite defense vs Ohio State's elite pass offense is a very intriguing match-up. It's tough to be certain on what will happen. If Chase Winovich is healthy and he, along with Rashan Gary, can pressure Haskins all day then Ohio State's offense will stagnate a lot. If Ohio State can hold off the pressure then I think even Michigan's elite pass defense will bend a lot, maybe even break. If you're a Michigan fan though, it's acceptable to hyperventilate in the fetal position. I'm still scratching my head about this. 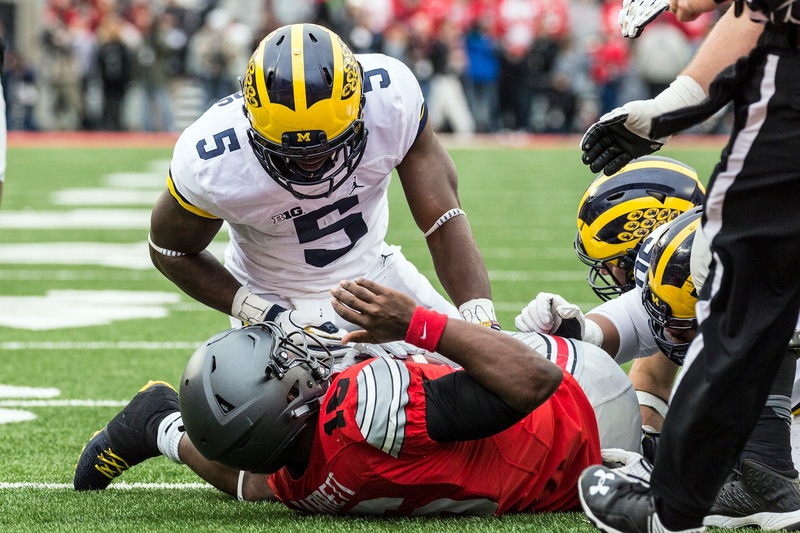 But here goes: per S&P+, Ohio State is the 5th best defense on Michigan's schedule at #36. The Buckeyes are giving up 399 yards and 24.6 points per game, which is not characteristic of a Buckeye defense that's usually in the top 10. That being said, the Buckeyes have the best defensive line on Michigan's schedule, but with a leaky secondary. The Buckeyes also have their own defensive end named Chase in Chase Young (#2). At 5.5 sacks and 17 solo tackles he will be a challenge to the Michigan tackles. The health status of Juwann-Bushell Beatty will be very important (signs seem to indicate that he will play). Let's talk about the secondary, though. Minnesota QB Zach Annexstad and Tulane QB Jonathan Banks both have their best adjusted QB rating games of the season against Ohio State (per ESPN). Penn State's Trace McSorley, Nebraska's Adrian Martinez, Purdue's David Blough, and Oregon State's Conor Blount all played one of their top 3 games in adjusted QB rating against the Buckeyes. Maryland's first two drives against Ohio State featured 81 and 75 yard runs. On the second, free safety Brendon White (#25) completely biffed the tackle that would've stopped it as a 3 yard gain. The Ohio State defense feels like a lot of 4 and 5 star guys who are not being properly coached. Giving up 339 rushing yards to Maryland and not having it be on your defensive line is a big red flag. I want to say that Michigan should be able to pick apart this defense. But logic does not always make sense in this game. On the other hand, though, Shea Patterson can throw the ball to DPJ, Nico Collins, Tarik Black, Grant Perry, Oliver Martin, Zach Gentry, Sean McKeon, Nick Eubanks, and Chris Evans. This coupled with the fact that we've seen Jim Harbaugh draw up some brilliant gameplans (much like last year, but with a competent QB this year). 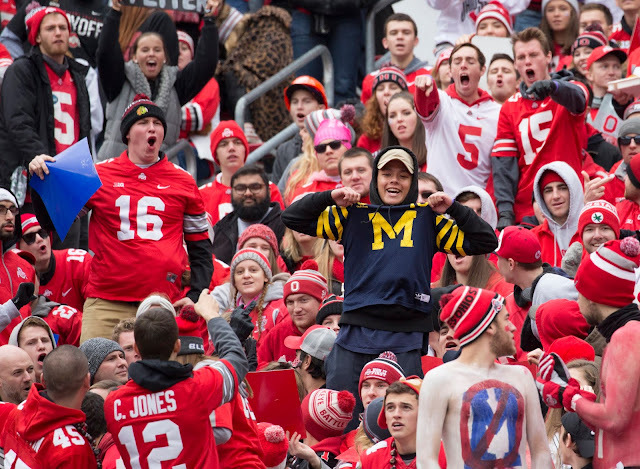 There is a non-zero chance that Michigan shreds apart OSU's secondary. Hold your breathe. I dunno, man. On paper this game favors Michigan. Fate favors Michigan. But dammit if we haven't been hurt before. 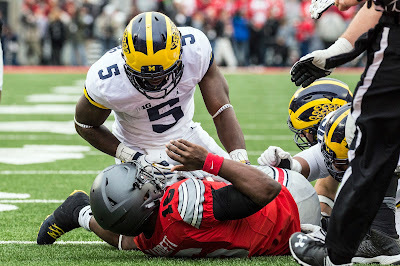 Still, I think Michigan completes the Revenge Tour with a win in Columbus.